Preparing chili is my all-time favorite thing to do. The boys love my "Super Chili" (meat, green pepper, onions, and tomatoes) and they want me to make it all the time. Unfortunately, the lack of time stops me from making my Super chili and boys are more than devastated when I serve them store bought or canned food. Personally, I too am not that thrilled when it comes to canned food, and I prefer making my own. But because chili has a complex texture and how much time it takes to make it I had to change my mind and search for the best canned chili my boys and I would love. Fortunately, after a lot of searching and trying out all kinds of chili, I have found few that are similar to the one I make and can be a good substitute. Many people avoid buying canned food. It has a bad reputation by not being safe health wise. Although I always prefer homemade instead of canned food, our lifestyle and the busy schedule doesn't allow us to choose. Fortunately, canned food can be a great way to eat healthy when we are in a hurry, without reaching for fast food (e.g, canned salmon). It has a great shelf life, so you can stock up on without worrying that it will go bad after a few days. Most of the chilies have vitamin A or vitamin C, a higher percent of magnesium and a little calcium. Always look on the back of the package for the nutrition facts. As well as airtight containers, canned food also needs to be BPA free. That's it! Don't overdo or overthink it; it's simple as that. Many manufacturers set very detailed nutrition tables on food packaging, which may confuse you, so it’s advisable to concentrate on the former two nutritive areas and you’ll be fine. You can eat it straight from the can if you are in a hurry and want your food to go. Or you are just too hungry, and the child in you doesn't allow you to grow up. Mix it with other dishes. I like to mix my chili with pasta or baked potatoes, and I always add some shredded cheese on top. Mmm, tasty! Use it as a dip for nachos when you have some friends over, or you just want to relax with new episode of your favorite show. Amy’s is a family business that produces organic and healthy food. Their grains and vegetables are grown organically without the use of harmful chemicals and GMOs. They make different types of chili: medium, black bean chili, spicy chili and low sodium varieties. My personal favorite is their organic medium chili with red beans and vegetables. I love it because it’s made from whole and natural ingredients, with a good source of protein and fiber. Also, it has a great thickness, and it tastes heavenly. Although I like my chili really hot, this chili has that sweet, little bit spicy but still worthwhile taste. It combines great both with rice and meat. 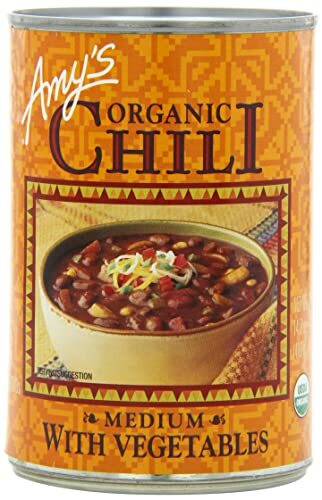 Speaking of nutrients and vitamins, Amys Organic Chili contains 590g (25%) of sodium and 30% of Vitamin A, 15% of Vitamin C, 4% of Calcium and 10% of Iron per serving. The chili is BPA-free, and it tastes great. 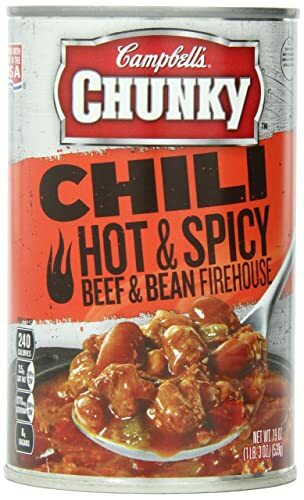 With this purchase on Amazon.com, you get a 12 pack, each containing 14.7 ounces of chili. The package is somewhere around 13 pounds all combined, and you get a good amount of food for the money paid. Campbells really now their way around chili. Their Hot and Spicy Firehouse chili is filled with beans, cooked beef, pork and red and green pepper that all together make perfect combo when it comes to food. I use it a lot in my kitchen because it resembles my homemade chili that my boys adore. I love it because it's thick, comes with a lot of meat and vegetables, but mostly I love it because of kidney beans they put in there that give very special taste. It's great to eat straight out of the can, but it can also be used with other meals. So if you are looking for good hot and spicy chili than this Campbell's Chili is the right choice for you. The packaging includes 12 cans of chili, each containing around 19 ounces of this flavorful chili. As you can see, this one doesn’t contain any Vitamin C and pack a bit more sodium than the previous chili. Even though it tastes great, it’s worth mentioning. Note: When you are purchasing this chili make sure that you get this one from the picture and not the new edition (the one with blue mark). Even though the ingredients are pretty much the same, the chilies are completely different. The new version is even more expensive than the old one. Looking at Skyline Chili, you can’t stay aloof; either you love it or you hate it, all depends on your taste. It' a bit different than other chilies because it has all kinds of ingredients like beef, tomato sauce, yeast, cornstarch, spices, salt, onion, garlic, and paprika. I mostly use it when I’m preparing pasta because it goes great with it. Tip from Barbara: If you are going to mix this chili with pasta try to put shredded parmesan (or any other hard cheese like cheddar or Gouda) on the top of the chili, the taste is to-die-for! Also, the Skyline chili is great as a dip with tortilla chips when you have some friends over but don't have the time to prepare something special. Basically, it is more like a sauce than regular chili. This package will get you four cans of chili, each containing 15oz, which combines to 3.2 pounds overall. Speaking of nutritional values, Skyline chili delivers 170mg (7%) of sodium, 4 grams of protein, 3% of Vitamin A, 2% of Vitamin C, 1% of Calcium and 3% of Iron. This puts it in the lower risk & lower nutritional value chili. 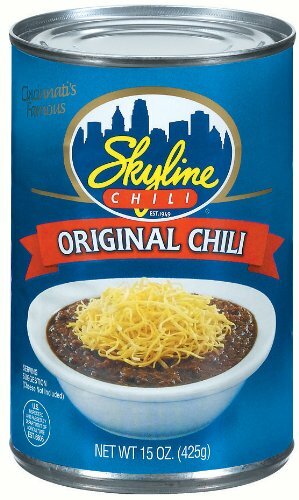 In the end, is Skyline chili worth purchasing? I can say – Occasionally, yes. The price is decent, the taste is unique, and the usability is high. When it comes to chili, Texans knows how things are done. This chili has the authentic taste, and it’s made from beef, green peppers, beans, onions, and tomatoes. It’s full of vitamin A and vitamin C, and also has 20 % magnesium and 8% calcium in it. The standard serving includes 880mg of Sodium which is tolerable (helps deliver that distinct flavor) and 17 grams of protein, which is great. The package sold at Amazon.com contains 12 cans with 15 ounces each (around 13 pounds for the whole package), making it very affordable and valuable, especially when you check the price. My husband says that it tastes almost the same as my homemade chili. I too have to say that it outshines every other canned chili I have tasted. I use it with cooked rice and pasta, and it is pretty much on the menu on a daily basis in my kitchen. It's love at first taste if you ask me! It’s highly affordable, delightful, and brings very high value for the money paid. Also, it’s imperative to mention that all my boys ate it straight out of the can as a meal, which didn’t happen with other chilies I brought for testing. I think that tells you enough how good Wolf Brand chili is. Hormel micro chili comes in small, versatile and useful containers for quick meals. It contains beef, beans, concentrated crushed tomatoes, and onions. And best of all it contains jalapeno pepper. And what’s a chili without the jalapenos? This chili is a good source of protein – 22% of the serving amount, or 13 grams. It has only 220 calories per package. On the other hand, it packs a substantial amount of Sodium, around 770mg (or 32%). That nutritional fact should be taken with care. The containers are cool – they are easy to open and ready in a jiffy by simply putting it in the microwave and heating for a minute or less. 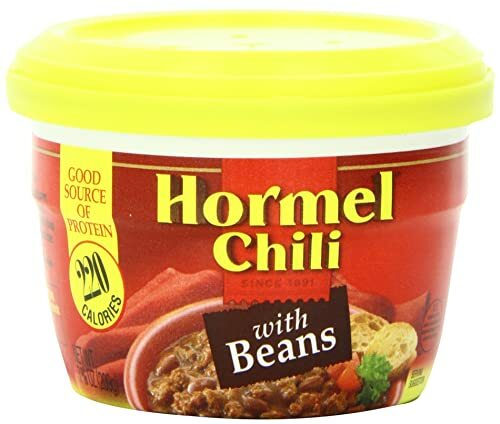 Despite the contained sodium, the Hormel Micro Chili doesn’t taste salty and spicy. Two people can easily split the portion, and they won't stay hungry. I like to pour it over baked potatoes and then to shred some cheddar over it. It also serves great as a dip for nachos when you are craving for some snacks when watching your favorite TV show or movie. The package includes 12 containers, each packing 7,30 ounces of chili. "Chili concocted outside of Texas is usually a weak, apologetic imitation of the real thing”. Lyndon B. Johnson, the 36th President of the United States is quoted as saying. “One of the first things I do when I get home to Texas is to have a bowl of red. There is simply nothing better”. And the award for authentic taste goes to... Texas! You can’t argue with Texas having the best chili in the world. 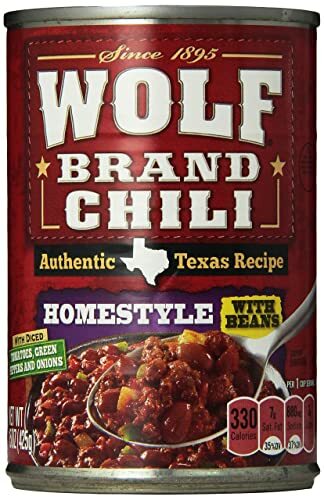 Wolf brand chili is everything you need your chili to be. It’s nutritious, filled with meat and vegetables and most important of all it has an authentic taste that you can’t find everywhere. It has a great mix of meat and vegetables that go great with almost everything you can imagine! The absolute best-tasting chili you can get in a can is Van Camp’s. Nothing else is even close. I’m glad you love Van Camp’s so much. My hubby shares your opinion, although I did manage to sneak in some Wolf in his quesadillas the other day. Love chili. Sometimes I make chili from scratch. Secret ingredient is a teaspoon of expresso powder in a big pot. A pinch would work for a can size. You don’t taste the expresso. Adds a another depth of delicious!!! I also put expresso in chocolate recipes. Just sends recipe over the top with enhanced flavor. Try it. You will never do without it. Hello Vickie, and thank you for your comment! I’ve definitely tried adding some espresso powder to chocolate treats and I liked it a lot! It’s definitely the sort of ‘secret ingredient’ that I like to keep secret. However, I never even thought of using it when making my own chili! I’ve used a pinch of dark chocolate in my chili before and that turned out great so I’m definitely willing to try out using some espresso powder! Thank you a lot for the tip and I’ll tell you how my espresso-powdered chili turned out when I get around to making it. Have a nice day and good luck with your cooking!